The game of slang! 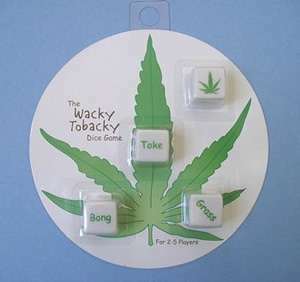 Wacky Tobacky is a dice game of pot slang terms. Simply roll all the die and pick two die to create a new slang term for marijuana. The term must make sense to all the other players. Use the potleaf symbol as a wild card. If you cannot finish a new term you must then do any dare your friends pick. It’s a "burn-head, hippie-bag" good time!